Analysis by Bernard Markstein The non-seasonally adjusted construction unemployment rate for the country and 40 states declined in May, while the rate for one state (South Carolina) remained unchanged from April. Today’s report provides further evidence that construction and the broader U.S. economy appear to have rebounded from the unusually brutal winter. 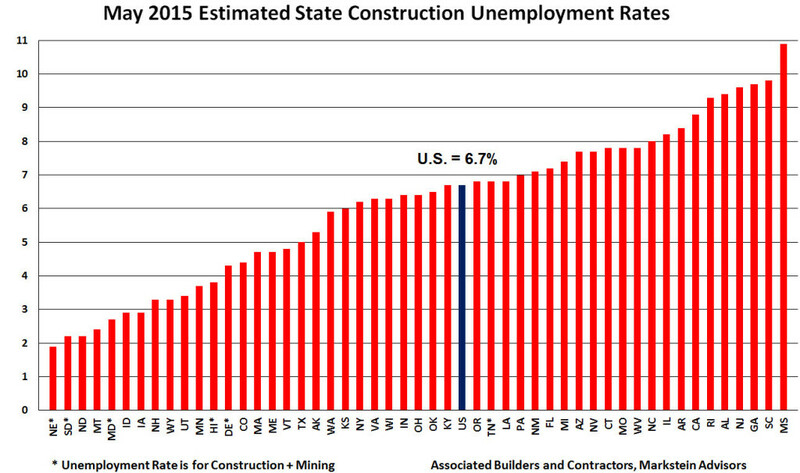 On an annual basis, construction unemployment rates for 44 of the 50 states fell in May 2015 compared to May 2014. The construction unemployment rate for two states—North Dakota and Utah—were unchanged.The release of today’s state-level construction unemployment estimates follows the June 5 Bureau of Labor Statistics report stating construction jobs increased by 17,000 in May following the addition of 35,000 jobs in April (both are seasonally adjusted figures). As of May, year-to-date seasonally adjusted construction jobs were up by 112,000, while the industry added 290,000 jobs from May 2014 to May 2015 on a non-seasonally adjusted basis. In addition, on June 24, the U.S. Department of Commerce revised its first quarter real (inflation-adjusted) gross domestic product report from a drop of 0.7 percent at a seasonally adjusted annual rate to a milder 0.2 percent decline. The Census Bureau also reported on June 1 that total seasonally adjusted nominal (current) dollar construction spending increased 2.2 percent in April. 5. Maryland** Unemployment Rate for Construction and MiningNote that the top four states are in the same geographic region, although the Census Bureau puts Montana in a different census division (West North Central for Nebraska, South Dakota and North Dakota, but Mountain for Montana). Three of the top five states were also among the top five in April, though the order was somewhat different. Nebraska retained its top position (based on revised data; it was originally number three in April). Wyoming was originally listed as number one in April, but revised data pushed it to number eight for that month, a position it held in May, tied with New Hampshire. Second place South Dakota moved up from a revised third place in April, sending North Dakota to third place in May. North Dakota was originally reported as being in fourth place in April, but revisions in other states’ estimated construction unemployment rates moved it up to second place for that month. Fourth place Montana moved into the top five from seventh place in April (originally listed as eighth place). Utah, April’s revised fourth place holder, dropped to 10th place in May, even with its low 3.4 percent estimated rate. Number five Maryland moved up from sixth place in April. Iowa, which held fifth place in April based on revised data, took over Maryland’s sixth place slot for May. May marked a changing of the guard for the bottom five. Only one of the states with the five highest construction unemployment rates in April remained in the bottom five in May: Georgia. Based on revised data, Georgia tied with Rhode Island and West Virginia for the highest rate in the nation in April. Meanwhile, Mississippi took over the unenviable distinction of the highest estimated construction unemployment rate in May after being tied for sixth highest in April. Although Mississippi’s construction unemployment rate fell by 0.7 percent from May 2014, its rate was up 1 percent compared to April 2015. Mississippi was the only state with double-digit construction unemployment in May compared to five states in April. South Carolina moved from eighth highest in April to second highest in May. Its May rate was unchanged from April and 0.3 percent higher than in May 2014. New Jersey was tied with Mississippi for sixth highest in April. It moved to fourth highest in May despite its construction unemployment rate declining 0.3 percent from April and dropping 1.4 percent from May 2014. Alabama moved from tied for 13th highest in April (tied with New York and New Mexico) to fifth highest in May. Its May rate was up 0.6 percent from April even though the May rate was down 1.4 percent from May 2014. West Virginia, which has struggled with a difficult economy due to low energy prices and reduced demand for exports, improved from the third highest construction unemployment rate in April to tied with Connecticut and Missouri for 11th highest in May. Connecticut, which had the fifth highest rate in April, also saw improvement and has seen the second largest drop in its year-over-year construction unemployment rate behind first place Michigan. Rhode Island, which also tied for the highest rate in April, improved to sixth highest in May, moving for the first time in several months out of the group of five worst construction unemployment rates. Rhode Island had the fourth biggest decline in its year-over-year construction unemployment rate behind third place Kentucky. California, which had the fourth highest rate in April, improved to seventh highest in May. Read more on ABC’s website. Associated Builders and Contractors (ABC) launched its state-by-state economic analysis earlier this year with the release of economist Bernard M. Markstein’s analysis of construction’s contribution to each state’s gross domestic product. 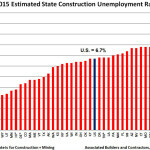 Unique to ABC, Markstein also compiles a monthly state-level construction unemployment rate estimate. His analysis of the construction job market and unemployment rate in each state for May is below. This analysis is produced monthly in addition to ABC’s existing national economic data and analysis. Background on how the data was derived and Markstein’s methodology is available on ABC’s website. Markstein is also available for an interview to provide further analysis.